The alleyways of the Old City of Hebron leading away from the famed Ibrahimi mosque — where the biblical patriarch Abraham and his family are buried — are almost always eerily quiet. But the barriers are not only horizontal; it doesn’t take long to spot through the gaps in the alleyway ceilings the Israeli settlers build atop Palestinian homes, with wire placed strategically by Palestinians to protect the street from the trash and urine thrown down from above. For local Palestinians, however, the attacks from settlers and Israeli soldiers — who are widely seen as complicit in the violence — do not only come on the street. Because of the Old City’s dense urban fabric, settlers and soldiers often conduct home raids by hopping across roofs and entering through the traditional courtyards at the center of area homes. “The Israeli soldiers raid the house from the rooftops, as if nobody lives in this house,” she told Ma’an during an interview in her family room. Although for years she had to put up with a few raids a month by soldiers who wanted to inspect the property — and intimidate the family into leaving, she suspects — since January, the raids have started occurring on a twice-daily basis. While a Ma’an reporter was sitting in her home, two Jewish settlers with New York accents carrying automatic assault rifles accompanied by armed Israeli soldiers walked across the roof and climbed into the family courtyard. They entered the room where the interview was taking place and gesticulated at different parts of the home, discussing how to re-arrange the dwelling after they forced the al-Atrash family out. None of the four intruders seemed at all perturbed by the presence of the family matriarch, her three children, or even the Ma’an journalists on the scene. Al-Atrash shows the room where she says Jewish settlers enter. but Jihad says soldiers have targeted the children when they use them. The children’s fear is not without warrant. In addition to the casual way the soldiers and settlers brutalize the family members during home raids, the violence often takes more bloody forms. Jihad told Ma’an that on Aug. 11 a Jewish settler threw her four-year-old son off the family’s balcony during a dispute, leaving him with a head concussion and unable to walk properly. The committee refurbished the two rooms beside al-Atrash’s home and offered them to her last year. But there was a problem: during the work, settlers noticed the empty rooms and drilled a hole into the building, planning to attach them to a Jewish-only settlement next door. Once the rooms were connected to al-Atrash’s home, the settlers began carrying out daily, and then twice-daily, raids, entering the rooms and continuing into the house itself to force the family out. When the raids occur, the whole family is crowded into one room and forced to stay there for hours. Al-Atrash told Ma’an that often the soldiers come while the family is in the courtyard, disturbing their sense of safety and forcing them to wait in the bathrooms while the settlers look around. an entrance in the building beside it forbidden to Palestinians. One of the holes used by soldiers and settlers to enter the al-Atrash home. have been told they would be detained if they crossed the threshold. Officials at the Hebron Rehabilitation Committee told Ma’an that the harassment comes in waves, as settlers decide to target individual homes one by one until they can take over the neighborhood. Despite the recurrent attacks, the committee said they had been able to renovate 1,000 units in the Old City allowing 6,000 people to return to live in the area. But the wider success of Hebron’s rehabilitation means little for the women forced to endure daily attacks just to be able to stay in their homes. Most of the women in al-Atrash’s neighborhood spend most of the day working at home with their children or seeing each other, meeting regularly and updating each other on soldier’s movements while their husbands spend long hours at work. When the settlers raid, the women send children between the homes to relay the news and spread warning of an impending raid on neighboring homes. atop these roofs seconds before the photograph was taken. 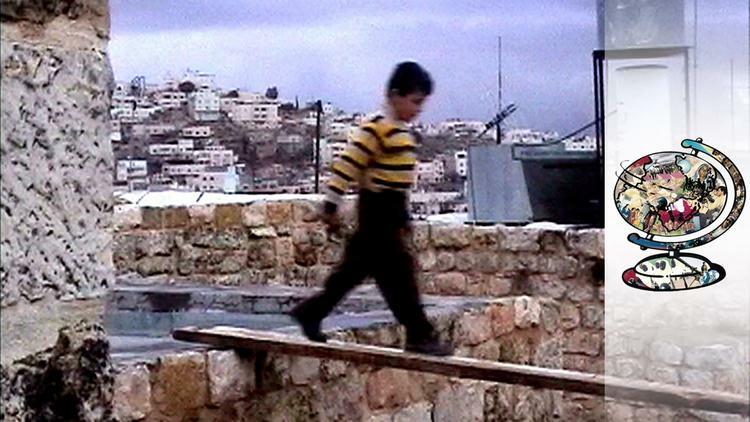 Al-Atrash children walk a path used by Israelis to enter their home from the side. In Hebron’s Old City, more often than not, it is Palestinian women who defend their homes, their families, and their very lives from the daily cruelties of the Israeli occupation. Her home once opened onto the Old City’s main drag, Shuhada Street, but the main entrance has been shut since authorities closed the road to Palestinians after the 1994 massacre of more than two dozen locals by a settler wielding an automatic rifle in the Ibrahimi Mosque. As a result, she was forced to drill a hole onto the back side of her home so that her family could come and go, but the discreet entrance hasn’t stopped the harassment. As Ma’an reporters sat with the woman in her home, three of her daughters and one of her sons sat nearby interrupting every once in a while to add details. One daughter had been beaten so severely by a settler on the street that she couldn’t walk afterwards; the son said he had recently been interrogated for six hours by Israeli officers who pressured him to become an informant. The previous front door of the home, now closed shut. She explained that although these days she was facing fewer problems, on Jewish holidays the situation became just as bad as the old days. “The Palestinians in the Old City are stuck in their houses. The Israeli soldiers do not allow anyone to step out,” she added. And the raids on their homes, at day and night, continue. A few weeks after first meeting Jihad al-Atrash, Ma’an returned to the house to check on the situation. The raids continued day and night, and the settlers and soldiers had begun targeting her children more clearly as they walked to and from school. Afraid of leaving her children at home unattended, meanwhile, lest the soldiers come, al-Atrash told Ma’an she felt increasingly trapped and hopeless. “The workers who used to work to rehabilitate and expand the building were all detained by Israeli soldiers, and I am sure they will not come back again here,” she added, explaining her growing fear that the family would be forced from the home once and for all if the harassment persisted. With Israeli authorities’ grip on the occupied West Bank only increasing as the days go by, it remains to be seen whether the resistance of individual Palestinian women alone will be enough to save Hebron’s Old City.